Key Difference: Torque (moment or moment of force), the word has been derived from Latin which means ‘to twist’. It is a tendency which measures the amount of force which acts upon a body in order to rotate it about a pivot or axis. Momentum is a property possessed by moving objects and is directly proportional to both mass and speed of the body. It can be described as a quantity which is associated with an object’s resistance to stopping. (It is a cross product between the distance vector (distance from pivot point to the point where the force is being applied) and the force vector) and a is the angle between r and F.
The direction of Torque is determined by using right hand rule – direct fingers towards r and then curl towards the direction of F. In this particular instance, the thumb will be pointing towards the direction of Torque. The SI unit of torque is a Newton-meter. Momentum is another vector quantity. It is a property possessed by moving objects and is directly proportional to both mass and speed of the body. An object with a greater momentum is hard to stop than in comparison to an object with a lesser momentum. Thus, it can be described as a quantity which is associated with an object’s resistance to stopping. One can also refer to it as a type of moving inertia. The direction of momentum is the same as the velocity of the object. Torque can also be defined in terms of angular momentum as the rate of change of angular momentum. It is a property possessed by moving objects and is directly proportional to both mass and speed of the body. It is a tendency which measures the amount of force which acts upon a body in order to rotate it about a pivot or axis. It is a vector quantity. Same as the velocity of the object. It is conserved when there are no external forces acting. It helps in understanding collisions. It is calculated with respect to (about) a point. 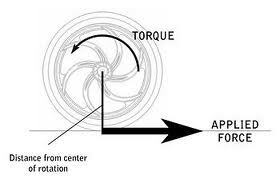 A change in the point changes the magnitude and direction of the torque.